How do you determine the most appropriate weight for each exercise? You must overcome four problems in order to develop biceps. After reviewing these obstacles, we will explain how to move past them. How do you select the exercises that will work best for you? 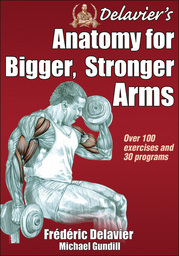 In this book, we have carefully selected the most effective exercises for the arms. However, they might not all work well for you. Indeed, morphologies differ from person to person. There are tall people and short people as well as arms and forearms of various sizes. Best-selling author Frédéric Delavier brings his singular style to a resource designed to help serious weightlifters increase mass, definition, and strength in their biceps, triceps, and forearms. Delavier’s Anatomy for Bigger, Stronger Arms is filled with over 330 full-color photos and 130 distinctive illustrations that highlight more than 100 exercises. Delavier’s Anatomy for Bigger, Stronger Arms is your guide to the massive biceps, triceps, and forearms you’ve always wanted. Over 330 full-color photos and 130 anatomical illustrations allow you to go inside more than 100 exercises to see how muscles interact with surrounding joints and skeletal structures and how variations, progressions, and sequencing can isolate specific muscles to help you achieve targeted results. It’s like having an X-ray of each exercise! Delavier’s Anatomy for Bigger, Stronger Arms includes over 30 proven programs for strength, size, and sport performance. You’ll also learn the most effective exercises for your goals; how to determine weight, repetition, and frequency; how to prevent tendinitis, muscle tears, and forearm and wrist pain; and strategies for varying your routine to ensure constant gains and optimal results. Whether you’re looking to quickly increase the size of your biceps or correct imbalances between the heads of your triceps, Delavier’s Anatomy for Bigger, Stronger Arms provides serious training for serious results. It’s all here and in all the stunning detail that only Frédéric Delavier can provide! The former editor in chief of PowerMag in France, author and illustrator Frédéric Delavier is a journalist for Le Monde du Muscle and a contributor to Men’s Health Germany and several other strength publications. His previous publications, Strength Training Anatomy and Women's Strength Training Anatomy, have sold more than 2 million copies. 1. How should you define your goals? 2. How many arm workouts should you do each week? 3. Which days should you work out? 4. Should you work the biceps and triceps separately? 5. What time of day should you work out? 6. How many sets of arm exercises should you do for each muscle? 7. How should you adjust the volume of work? 8. How many exercises should you do during each workout? 10. How many repetitions should you do in each set? 11. How quickly should you do repetitions? 12. How do you adjust the range of motion in an exercise? 15. How do you determine the most appropriate weight for each exercise? 17. How much rest time should you take between exercises? 18. How do you select exercises based on your anatomomorphology? 19. When should you change your program? 20. Should you take a vacation? How Should You Breathe During a Workout? 2. Build Your Arms Quickly! Anatomical Dilemma: You Must Work the Biceps From Every Angle in Order to Develop It! Anatamomorphological Dilemma: Should You Straighten Your Arms During Curls? Are You a Hypersupinator or a Hyperpronator? Biomechanical Dilemma: Are Curls a Compound Exercise for the Biceps? Is a Fixed or Rotating Schedule Best? The former editor in chief of the French magazine PowerMag, Delavier is currently a journalist for the French magazine Le Monde du Muscle and a contributor to several other muscle publications, including Men's Health Germany. He is the author of the best-selling Strength Training Anatomy, Women’s Strength Training Anatomy, The Strength Training Anatomy Workout, The Strength Training Anatomy Workout II, Delavier's Core Training Anatomy, and Delavier's Stretching Anatomy. Michael Gundill has written 13 books on strength training, sport nutrition, and health. He coauthored The Strength Training Anatomy Workout, The Strength Training Anatomy Workout II, Delavier's Core Training Anatomy, and Delavier's Stretching Anatomy. His books have been translated into multiple languages, and he has written over 500 articles for bodybuilding and fitness magazines worldwide, including Iron Man and Dirty Dieting. In 1998 he won the Article of the Year Award at the Fourth Academy of Bodybuilding Fitness & Sports Awards in California.